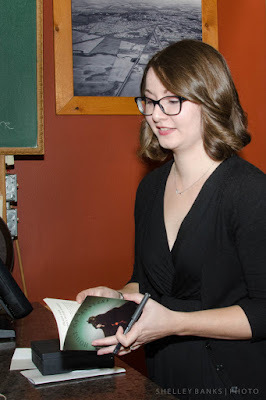 Fall book launch season has started, and I was glad to be able to make the launch of Courtney Bates-Hardy's first poetry collection, House of Mystery. The event was at Bushwakkers — always fun — and not on a Thursday, so it didn't clash with my class. 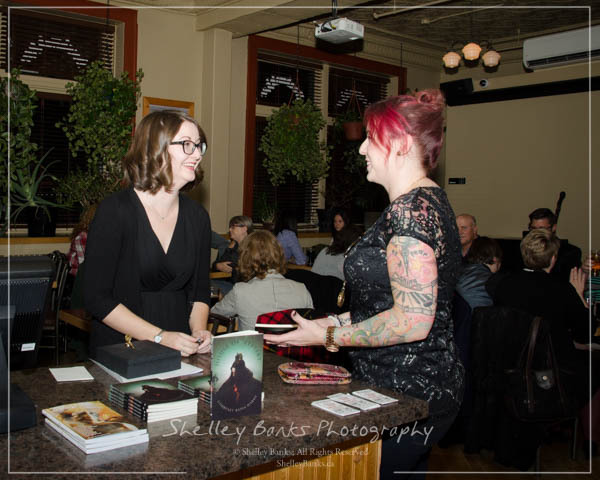 (French, if you were wondering...) Courtney read with guest writers Janet Nicolson and Amber Godwin. House of Mystery is a beautifully dark and vivid collection of poems that tears down our familiar ideas about fairy tales. These are not poems about privileged princesses who live happily ever after; these are poems about monsters, mothers, witches and mermaids. They explore the pain of change and womanhood, and transform the way we think about fairy tales. Bates-Hardy moves through the childhood stories and delves into the violent and problematic origins of Cinderella, Snow White, and many other favourites. Lyrical and haunting, her poems will follow you long after you find your way through the forest.